This entry was posted in Board of Trustees, Supervisor Gonser, Tea Party ideology and tagged Board of Trustees, Gonser, oakland township, Oakland Township Board, Supervisor Gonser, Supervisor Terry Gonser, Tea Party in Oakland Township, Tea Party Leadership, Terry Gonser on February 19, 2014 by richardjmichalski. On January 6th, Ann Capela was hired by our Township Board as our Township manager. In the January 30, 2014 Rochester Post there was an article titled “Township manager seeks smart growth”. In the article, Ann makes several comments that clarify the direction she wants to take the Township under the leadership of our current Board. Unfortunately that direction is contrary to what the citizens have expressed in past surveys. Oakland Township has always viewed our Master Plan as the document that defines what our residents want our Township to be. The Plan defines the level and type of development that our Township desires. In essence, the “horse’ is the Master Plan and the “cart” is development. It now appears that our new manager and Supervisor, appear to want to put the “cart” before the “horse” by having the Master plan “marry up” with the development. As a member of the Township Planning Commission for 26 years, we never placed the desires of developers before the desires of the residents. One only needs to drive down Rochester Road and the see the results of letting developers define their communities. Just because someone purchased a parcel of land for a ‘lot of money’ does not entitle them to redefine the land use in the Master Plan. Individual property rights are protected, however, they are protected within the confines of our Master Plan and Ordinances. Before someone buys a parcel, they should make sure their intended use is consistent with the Zoning and the Master Plan. In Supervisor Gonser’s recent State of the Township address, he indicated that he plans on updating the Master Plan. With his recent appointments of campaign contributors to the Planning Commission, we may see some significant changes in our next Master Plan. 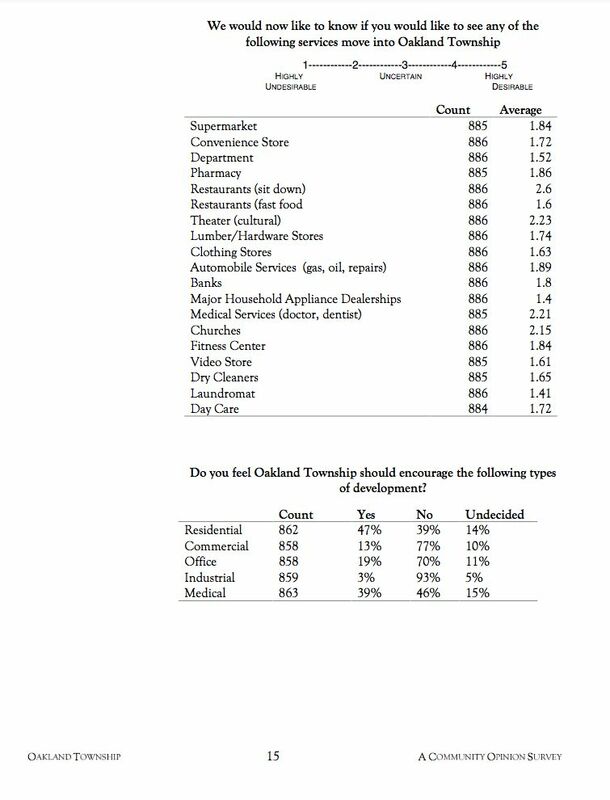 Here is one page from the citizen survey used in developing our 2005 and 2011 Master Plans. It clearly indicates a strong desire by our residents to not encourage various types of development in our Township (click on page to enlarge). Why is this important to the citizens of Oakland Township? If our Master Plan is significantly modified under our current Township Board, the character of our Township will likely change dramatically. Our citizens must be vigilant in watching what our new Board and Planning Commission will be doing in the next few months (and years). If we are not vigilant, the “tracks” that Ann Capela talks about putting down may end up being for the “train” (with significant development) our current Board, under the leadership of Gonser, envisions. This entry was posted in Ann Capela, Board of Trustees, Supervisor Gonser and tagged Ann Capela, oakland township, Oakland Township Board on February 10, 2014 by richardjmichalski.